a thankful november: today. | there's no place like gnome. It’s Monday. Nobody likes Monday. But today was a good Monday for this pastor. It started with quilting with the ladies, and by quilting I mean I had coffee with them and then, of course, potluck lunch. I brought cakepops to share. I had many in-depth conversations about cakepops. It’s cool. I like to talk about them. A communion visit and then coffee with my mentor? Good. Conversation with seminary roomie via mobile? Good. Good news via text from a pregnant friend in Montana? Good. Council meeting? Council meetings typically leave me in tears. I’m usually frustrated at my inability to lead. They’re long. Sometimes respect for each other isn’t there. But tonight – it was good. First, we started with worship. I normally lead devotions [read: lame] but tonight I wanted to give them a sneak peak at Holden Evening Prayer, a service we are trying during Advent this December. The council didn’t seem entirely thrilled – especially the men – but they stuck with it. It took a half hour – much longer than typical devotions. I wondered if they hated me for it. But I think they were okay. Then I presented them with a possible mission statement for Red Oak Grove. To get to it, I made them play hangman. They guessed letters and I filled them in to get Gathering in grace, growing in faith, going forth to serve. They humored me and then we had a decent conversation about the statement. THEN the meeting was about to wrap when someone spoke up. This person is one in charge of the church’s seminary endowment fund. [a fund of money we can’t touch but to support future pastors in seminary with the interest gained.] No one is using the fund right now. Maybe our pastor could use the interest gained this year for her seminary loans? It’s not much, she said. It didn’t matter how much; I was humbled at the thought. We held hands [yeah. we do that. ], said the Lord’s prayer, and the meeting was over. The meeting was just over an hour. That’s at least thirty minutes shorter than usual. And then Paige posted this photo from last night on facebook. 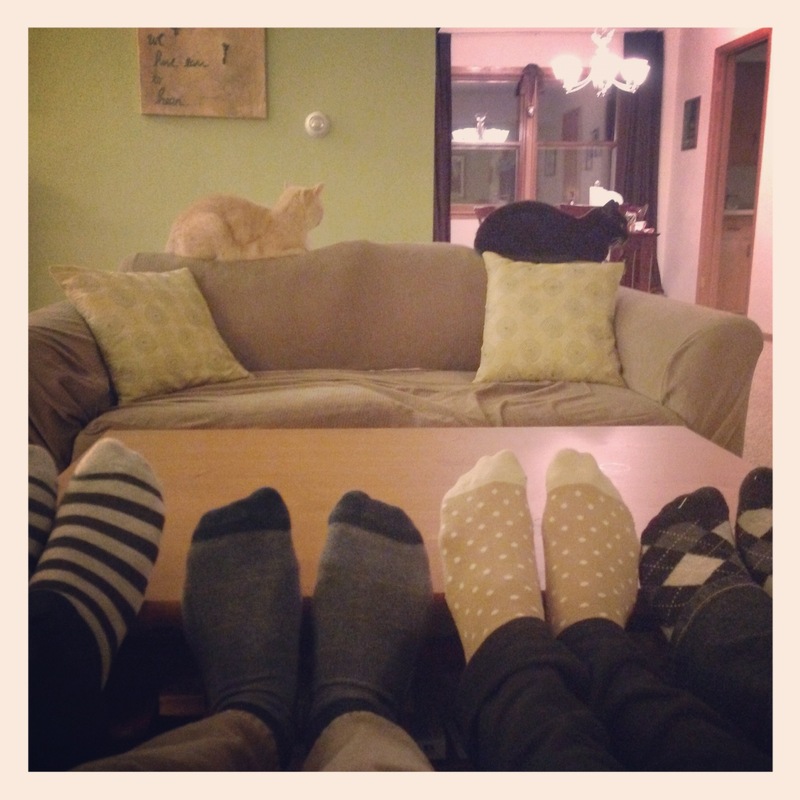 Thankful for the feet of friends [and the rest of their bodies, too].